Another Paula Deen comfort-food recipe turned deliciously vegan in my hot little hands... This one's mind-numbingly simple, and I admit I throw it together far too often when lack of creativity/time and ingredients strike. I posted this several years ago and Bianca over at Vegan Crunk suggested pairing it with roasted veggies. Yum!! That seems to be the chosen side dish we've served it with ever since. Thanks for the idea!! Anyway - fast, simple, tasty. Try it. My kids especially love the "crunch" of the little black poppyseeds. Melt the margarine in a large skillet over medium-high heat, stir in Tofutti "Sour Cream" and soymilk and lower heat. Stir until warmed through. 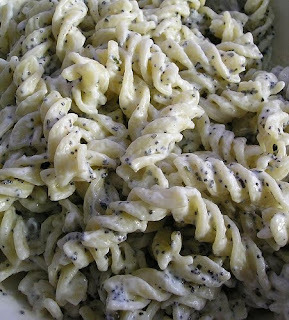 Toss the cooked pasta, poppy seeds, Tabasco, chives, salt and pepper in the sauce. Serve immediately.